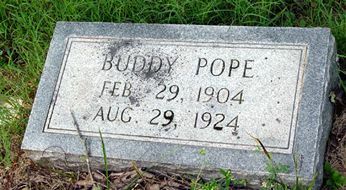 Covington Pope, son of Calvin D. "Cabe" Pope and Alba Abernathy. Kingston, Georgia, September 04 – Covington Pope, the twenty-year-old son of Mr. and Mrs. Cabe Pope, who was injured while diving in the river last Sunday, died at Harbin hospital, Friday morning. He and several other boys were enjoying a swim after a week’s hard work in the fields during the hot weather, when the grapevine from which they were diving, broke, it is said, throwing young Pope into the water, so his head struck the bottom, fracturing his neck. Had he been carried at once to the hospital, the surgeons were of the opinion that he would have a good chance to recover, but inflammation set in by Thursday night when the ambulance was sent for, so it was impossible to save him. The funeral was held Saturday morning at Mt. Pleasant church, several miles below Cartersville, Rev Hart, of Atco, conducting the services. Covington Pope is spoken of by those who knew him well as a good, steady, hard working boy, and his tragic death is regrettable by a large number of friends.